Always click Save to activate any changes you make! 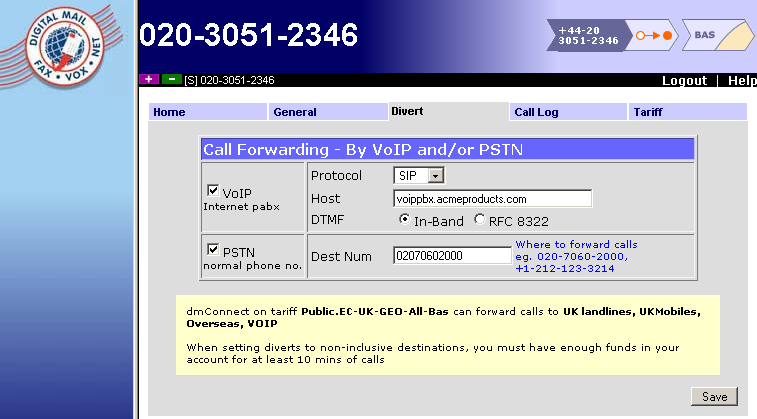 This is where you set forwarding of your calls via IP to a VoIP server. Tick the "Voip - Internet PABX" box to enable this feature. SIP - A widely used protocol for VoIP. Fairly simple to setup but can struggle to get through firewalls and routers. IAX2 - A protocol most closely associated with the Asterisk Open Source PABX package (and derivatives thereof). Slightly more complex setup but designed to improve access through firewalls / routers. Host - the address of your VoIP server/PABX as an IP address (e.g. 87.215.32.121), or a hostname (e.g. pabx.acmeproducts.com). DTMF - Whether DTMF tones should simply appear in the audio stream (in-band) or as explicit protocol signalling (RFC 8322). This setting often doesn't matter, but if you are having trouble with a tone-driven application on your system, changing this setting may help. Calls should be answered immediately with a "congratulations" message followed by an echo-test (the system plays back to you what it hears as quickly as it can - usually within about 0.2s). If this is what you hear, then your dmClub number is working correctly. If you firewall UDP traffic on your network you must ensure the above subnets are permitted. Please note that we do not support Asterisk, and this is a friendly hint to VOIP PABX-savvy professionals.